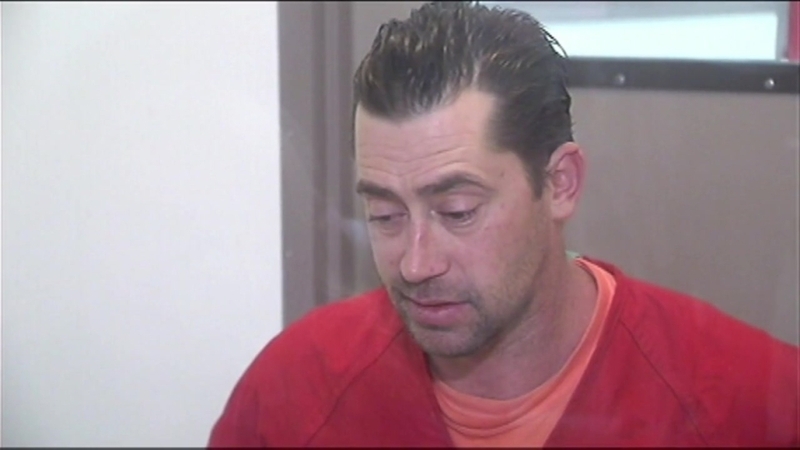 A Los Altos, California, man who was arrested on suspicion of killing his co-worker told NBC Bay Area in a jailhouse interview Monday he didn’t do it and had been set up. "I was framed," Steve Hlebo, 39, said from jail in a 45-minute interview. "I am innocent. It's something out of a science fiction novel, really." Hlebo spoke to reporters at the Santa Clara County Jail, telling them he didn't leave work Friday until about 5 or 6 p.m. and spent the next several hours — until 2 a.m. Saturday — driving around the Bay Area because he couldn’t sleep. He adamantly denied killing Kyle Myrick, 28, who was reported missing Friday and whose body has yet to been found. The two worked together for a short time at GP Sports in San Jose's Cambrian neighborhood on Camden Avenue. Police declared the burned-out building next door as the site of the weekend homicide, without saying why. Hlebo was arrested Saturday on one count of murder at his mother-in-law's home in Los Altos. He has yet to be formally charged. "I was hopped up on drugs," Hlebo said, claiming that "four or five individuals" that he worked with must have put the unknown drugs in his drink. He insisted he had no mental illness, was not taking any drugs himself and had no other priors other than a past DUI. However, a check at the Santa Clara County courthouse showed Hlebo had five past criminal cases from 2000 to 2005, though the records were in storage and a clerk would not detail the charges. Myrick has no criminal record in Santa Clara County. San Jose police did not respond specifically to Hlebo’s jailhouse claims, which NBC Bay Area was not able to substantiate right away. San Jose police have yet to reveal a motive for the homicide or evidence that would link Hlebo to Myrick's death. At a news conference Monday, Police Chief Eddie Garcia said they thought the body might be somewhere in the ocean, but didn't have evidence to confirm that. Wearing an orange jumpsuit and shackles, Hlebo said he believes someone at work must have been drugging his coffee "for days" and that’s why he hasn’t been able to sleep. "I think they were putting it in intentionally so they could discredit me and pin the murder on me, essentially," Hlebo said Monday. He didn't specify exactly who the co-workers were, or why they would want to harm him. Hlebo said he barely knows Myrick, whom he had worked with for "four or five days" and had no idea where Myrick had disappeared to on Friday. After work on Friday, Hlebo said he was driving around for hours in his GMC truck, a photo of which police released on Monday, because he couldn't sleep. He returned home "drained." Moments after he lay down, he said "bright lights were in the windows." Police are asking for the public's help in determining where the truck was between Friday at 6 p.m. and Saturday at 5 p.m. In an odd statement from jail, Hlebo told a confusing story about being sold this truck with what appeared to be either "boar's brains" or human blood inside the brake area of the truck that someone sold to him and which had been in a "horrific accident." That truck, Hlebo claims, is somehow part of the confusing coverup. Despite the charge, Hlebo appeared calm, albeit tired, during his interview. At a news conference later on Monday at the San Jose police station, Myrick's mother spoke out emotionally. Myrick’s family and friends staged several volunteer searches throughout the South Bay looking for his body, hoping the avid motorcyclist is alive. "I just think he's lying, and he's trying to put the blame on other people," Kelly Sparry said. "He's my baby and I want him back."